The midterm elections are less than a month away. Are you registered? Is you registration current? Registration in Missouri closes at 5pm on Oct 10th. It’s nice that the next governing signal was recently brought back. With that being said, it’s important not to to forget GCOR 9.9.1 - Approach to Automatic Interlocking. Rule 9.8 and PTC do not have an exception when delayed approaching an automatic interlocking. GCOR 9.9.1 applies at interlockings with an (A) symbol and also those with a (Z) symbol in the station column of the timetable. If you are below 25 MPH passing the signal prior to these interlockings or drop below 25 MPH after passing the signal prior, you must be prepared to stop until you are within 1,000 feet of the interlocking. There a a few exceptions in the St. Louis Timetable. One exception would be approaching Tuscola on the Pana Subdivision. The signal that this rule applies to is actually a few signals before the interlocking in both directions. The 6 hour no call is back in effect. Just to clarify, this programming change will block the system from calling you after you have been called to Step-up or cover a vacancy for a 6 hour period. When in this 6 hour calling window you will still be called for YOUR assignment. This is a step to help relive the non stop calls from CMS while we work to a more permanent solution. The other day I overheard a conductor telling the dispatcher about a dimensional load in her train. Great job. While excessive dimensional loads are pointed out on the title page of your train list, dimensional loads are only shown to be in the list of cars. There are similar requirements for both, so I thought that this would be a good opportunity for a refresher. Item 5-A in the SSI covers the requirements for High & Wides as well as high value loads. There are a few similarities as well a one major difference between dimensional and excessive dimensional loads. • Must be as close as possible to the head end, but no closer than the 6th car from an occupied engine when train lengthsl permits. Notice the word, occupied. HAZMAT rules apply to locomotives whether occupied or not. A little different here. •GCOR 15.2 specifically says that when you are to operate through a Form B you must notify the foreman of Excessive Dimensional loads. Although not required, I recommend notifying them of dimensional loads as well. This is important because there is often not a lot of room as you pass on-track equipment. Simply let them know of their presence in your train and the measurements shown on your train list. •You must have a job briefing with the dispatcher regarding both excessive and dimensional loads. This would also apply to foreign railroad dispatchers as well. •Subdivision specific speed restrictions, such as the 30 MPH locations on the Chester Sub, apply to both. Not just excessive dimensional loads. This is why it is always critical to review your paperwork for dimensional loads. The dispatcher can allow you to go through those locations at maximum authorized speed if he determines that there are no trains in the area. •Excessive Dimensional loads require a Form C Bulletin for each subdivision you will operate on. •Dimensional Loads do not require a Form C. Remember, you must still job brief with the dispatcher if you have them in your train. Whether you have Dimensional or Excessive Dimensional loads in your train, it is critical to know that they are in your train and understand the rules regarding their handling. All the instructions in Item 5-A are important to understand and follow. There have been a few questions raised about recent fuel conservation rule changes. Fuel Conservation Speed was recently reintroduced in the latest System General Orders. This time there are a few differences to the rule than before. Air Brake and Train Handling Rule 31.8.7 D outlines FCS. There are three key components remember. First of all, it is only FCS 50 this time. No FCS 40 for coal trains like before. Second, it is Notch 6 this time instead of Notch 5. This means that you cannot be above Notch 6 on the throttle if your speed is over 50 MPH. This does not mean that you can stay in Notch 8 until you hit 60 MPH, and then back off to 6. You can still go to notch 8 to get up to 50 MPH, but once you are above 50 MPH you must be in Notch 6 or below. Finally, there are a few exemptions added to the rule as well. Passenger trains, UPS trains, and trains operating with PTC-Integrated EMS. As a reminder, if you are using PTC and EMS is not integrated into your PTC screen, do not use it if it is in the engineer’s control screen. St. Louis Superintendent Bulletin 52 - Train Handling and Switching reintroduced the Notch 3 DPU requirement. There are two important parts to remember with this change. First of all, this applies only to EMPTY COAL TRAINS operating WITHOUT energy management, and only on specific subdivisions. Simply, the DPU cannot go above throttle 3. Also if you have less than 2,000 gallons you can disregard this requirement. However, you must report it to the dispatcher. The second part of the change is for those operating out of Jefferson City. The Kansas City crews are required to isolate the second unit on loaded coal trains eastbound on River Sub. When swapping out at Jefferson City, be sure to go back and put it back on-line before departing. We are pleased to announce that now through October 31st, 2018, we are holding the annual BLET UP Central Region Open Enrollment to allow any existing or new members to get enrolled in guaranteed approved voluntary Life/AD&D, Short-Term Disability and Long-Term Disability coverages. Please forward this email to all of your members to help spread the word. Members can visit https://uniondisability.com/groups/blet-up-central-region/ or call our office at 224.770.5316 for additional policy information and to enroll. If a member already has coverage and does not want to change anything, no action is required to maintain their current coverage. There are no rate or benefit changes as your plan is still under rate guarantee. Even though this enrollment is open until the end of October, we are encouraging members to not wait until the last weeks to enroll because of the high end of enrollment call volume that we anticipate. I have attached a flyer for you to post as well as a detailed rate sheet for your plan. If you would like hard copies of the flyers mailed to you please respond to this email with the number you would like and where to send. Please let me know if you have any questions and thank you for your continued support! I just got notified that 20 more borrow outs are comming rfom KC they are to be here on Thursday the 30th. They will beging qualifying trips and get marked up as soon as possible. With all of the new hires, borrow outs, and FIT’s out here I thought that a reminder of GCOR 1.47.2 would be appropriate. Employees assigned to a position for the purpose of training or familiarization must be under the direct and immediate supervision of a qualified employee at all times. The qualified employee must closely monitor the employee's performance and must be in a position to take immediate action as necessary. Any employee requiring certification must have a current certificate in his possession. The part that I wanted to focus on is the first two sentences of the rule. Notice that this applies not only to new hires assigned to you, but also someone assigned to the job for familiarization. This could be someone you are piloting or conductor on the AWRR board working with you. For example, if you have a borrow out working with you as a COT to learn the territory, you cannot use him a brakeman or send him up on the lead by himself to line switches. Even though he he his fully certified and may even have a lot of time on the railroad, more than you possibly, by this rule he must be under your direct supervision and you must be in a position to take immediate action as necessary. Many of the students I taught I now get the pleasure of working with. Some of them are even now my boss. Whenever I see or here of them doing a good job I have a great sense of personal pride in seeing them succeed. With that said remember what it was like when you started out here. Have patience with the new hires and FITs, take the time to teach them. Your career, livelihood, and safety may very well be in that persons hands tomorrow. Did you know that a safety stop is not required when making a coupling with light locomotives. The safety stop requirement is in Superintendent Bulletin 37 - Train Handling and Switching. I’ve heard people say it’s only not required if it’s just one locomotive. The exception says that a safety stop is not required when operating light locomotives to a coupling. Notice that locomotive exception is plural. It is also permissible to ride a locomotive to a coupling. Safety Rule 81.13 says not to ride “cars” to a coupling. 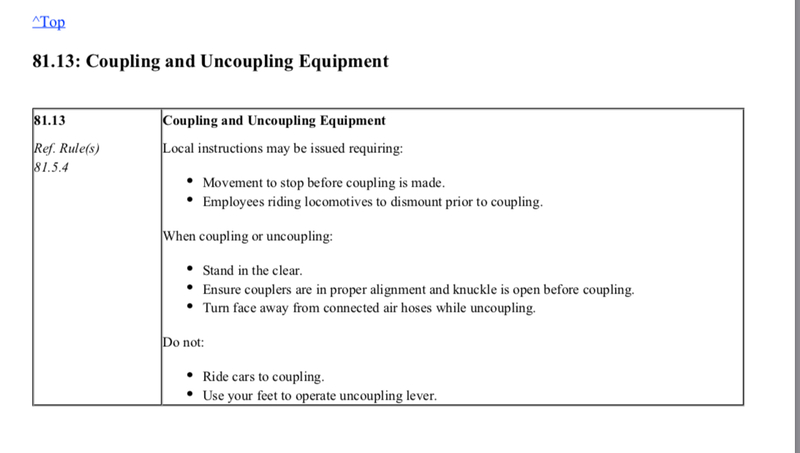 The first part of the rule says that local instructions may be issued requiring a stop before a coupling is made, and employees riding locomotives to dismount prior to coupling. Our local instruction requires a safety stop with cars only and does not require you to be on the ground when making a coupling with a locomotive. I hope this clarifies any misunderstanding of the safety stop requirement.